New developments broke Wednesday, relating the ongoing struggles of Leonard’s rehabilitation and stoking more speculation about his allegedly strained relationship with the team. Another chapter in one of the strangest Spurs sagas was written on Wednesday. 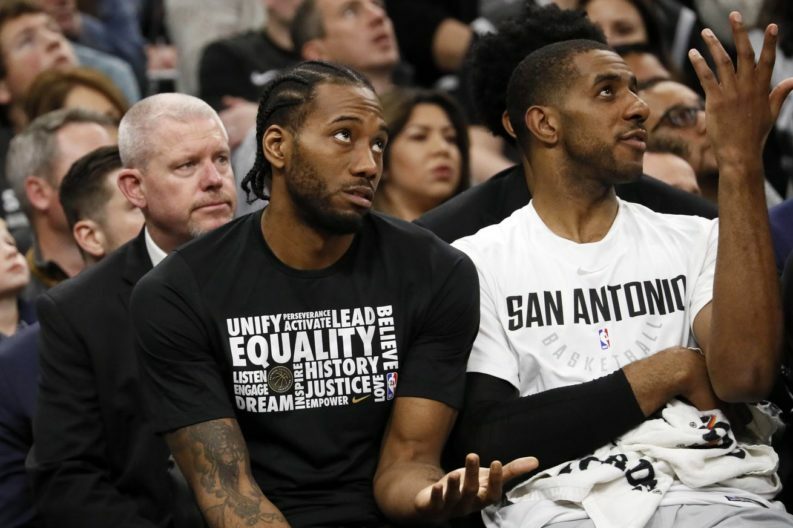 It began when Gregg Popovich addressed reporters at a team practice, providing a sobering update on Kawhi Leonard’s status and adding that he would be “surprised” to see him return this season. While Pop wouldn’t rule out the possibility of a late-season Leonard comeback, his comments understandably made waves. The Spurs are coming out of the All-Star break still holding onto third place, and the healthy return of the franchise cornerstone would (and could still) make a deep playoff push possible. Shortly after Pop’s presser, an Adrian Wojnarowski story broke reporting that Leonard had not only been seeking second opinions on his injury over the All-Star break — he’s been cleared to play by team doctors, but has elected not to. Given earlier reports by Wojnarowski and others that the relationship between Leonard and the team had been strained by the handling of his injury, Wednesday’s development seemed to affirm that it wasn’t just a quadriceps tendon that needed mending. Leonard has, of course, been mostly silent through all of this, excepting his appearance before the media on December 4th. The Spurs, also on brand, have shed little light on things themselves, leaving fans wondering about two situations we don’t understand. Using what we do know — and what we’ve recently heard — let’s try and gauge where things are now and where this team might be going. Let’s start with a line straight from Pop, as it’s a point he noted twice on Wednesday afternoon. In any given season, 23 games is a narrow window for any team to attempt to come together and make a serious run at a title. But with the Warriors and Rockets as dominant as they are, and with a healthy return for Leonard far from a given, expectations have to be tempered. On Wednesday, the Spurs might have begun to embrace that more realistic outlook. How realistic will this team be? What is this team’s best-case scenario, without Leonard, for the rest of the season? A second-round appearance—maybe? And that would still be hinging on the tenuous health of the rest of the Spurs’ veteran core. The final six spots of the West playoff picture are a game of chutes and ladders, and San Antonio, facing one of the most difficult remaining schedules in the NBA, could be susceptible to a slide all the way into the lottery, especially if the injury bug rears its ugly head down the stretch. All it would take is one little push. Might the team decide to play it safe if LaMarcus Aldridge’s knee issues continue? The team’s lone All-Star has already made good on his new contract and has little left to prove this season if the team continues to limp toward the finish line. Shutting him down in the next month could mean a substantially better draft pick, as well as a couple of ping pong balls in the lottery. That’s a line from the San Antonio Express-News’ Jabari Young’s piece, which was published shortly after Pop’s presser, and it feels especially pertinent when weighed against what Pop said. It hints at the rift between player and team, highlights Leonard’s continued apprehension, and also makes you wonder about the timing of the coach’s comments. Did he speak because he knew a story was about to come out? The quote feels less like cynicism and more like forward-facing pragmatism, which would line up with the additional floor time being doled out to Bertans and Murray, as well as rookie Derrick White, who played 28 minutes against the Golden State Warriors on February 10th. This could be an important time for the kind of evaluation and development that’s not conducive to winning games. Gay, who has been out since December 28th, is set to return against Denver on Friday. The good news is Rudy Gay is back, per Pop. If Gay can remain healthy, he gives an anemic Spurs offense some much-needed firepower while taking the load off Aldridge. At the same time, the forward, who has an $8.8 million player option for next season, could look to raise his stock if he chooses to opt out this summer. But Gay hasn’t looked quite himself, coming back from his own serious injury that he suffered over a year ago. He’s averaging 11.5 points and 5.2 rebounds per game in in 22.7 minutes, and his best outlook may lie in conservatively demonstrating a combination of health and productivity in the season’s final months. That’s when Leonard would be able to opt out of the last year of his current deal — if he hasn’t already signed a supermax extension with the Spurs by then. And there are 219 million reasons Leonard would want to do so. That’s the number of American dollars he’d get over a five-year period if he were to re-up with San Antonio, an offer no other team in the league can match. The Spurs reportedly shot down any possibility of trading Leonard before the 2018 trade deadline, suggesting that, as of now, they fully intend to keep their star forward around for the long haul. Given the amount of money on the table, it’s hard to imagine Leonard not wanting to smooth things over in the long run. It’s not always this simple, but it often is. However bad things have gotten through the most frustrating point of Leonard’s professional career, a return to health should initiate more wins, and few things bring people together like success. While speculation will likely continue about Leonard taking his talents elsewhere in 2019, the smart money should still be on a happier, healthier Leonard sticking around in the Alamo City for the foreseeable future.